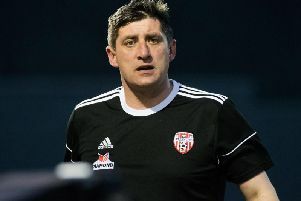 Stephen McDonnell, as the youngest manager in senior football, will share a sideline with one of the most experienced this weekend aiming to learn lessons off the pitch from Stephen Baxter but hopefully deliver a few on it to defending champions Crusaders. The top flight’s bottom-placed side are still searching for a first end product of the season after three games and McDonnell accepts the size of the task against a manager he holds in such high regard. Crusaders boss Stephen Baxter. Pic by Pacemaker. In spite of the blank return on the league table, it is a belief fuelled by defiance over disappointment. “You cannot help but admire the work of Stephen and Crusaders and I draw from how the club has been built up out of some difficult times to become what it is today,” said McDonnell. “We cannot call on the same trophy history or level of experience and success but still trust our squad to bounce back and it is not so much a case of picking anyone up off the floor at this stage but still about having faith in the process. “You will always have pain before the gain, with Crusaders’ history an example of that as they battled up from the bottom and, although we are not comparing the clubs overall, everything has to start from somewhere. “You put in the work and go game-by-game and I’d certainly embrace any opportunity to pick the brains of someone like Stephen given his experience. Crusaders boss Baxter appreciates his role as an elder statesman of the Irish League when measured by years’ service and silverware. “I remember coming up as a young manager looking to those with more experience and how valued it was when they took time out to offer encouragement,” said Baxter as he prepares to visit McDonnell’s Warrenpoint. “Sadly, things have maybe changed a bit in the game and there no longer seems that same time to spend with other managers. “With the exception being maybe a cup of tea on matchdays or brief discussion. “But certainly I am looking forward to the trip to Warrenpoint this weekend, even if it is a place which has proven a difficult venue to get anything from over the past few seasons. “Stephen will have his side well-prepared and, in the same way with any other manager, I respect the work he has been doing and how hard everyone works to prepare teams for these games. Baxter’s champions will also turn to experience as part of preparations towards a return to form off the previous weekend’s 2-0 defeat to Linfield. In a meeting between the past two seasons’ champions, Crusaders finished short of the standards set across past progress. “You never put too much emphasis on one game, especially so early in the season,” said Baxter. “You approach it fixture-by-fixture then move from one game to the next. “Irrespective of the result, you move on to the next challenge as you cannot change the past so should not dwell on it.